Xabier Osteikoetxea Veleze: CSIC-IQFR, Spain. 1st and 2nd Secondment: 2 and half weeks- with Prof. O. Ramstroms at KTH (2-8 March 2015), with Teodor Aastrup at Attana AB (9-15 March and 29 March-2nd April 2015) in Stockholm, Sweden. 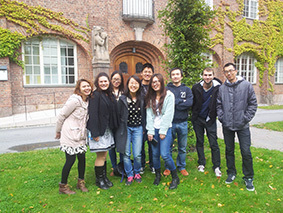 Feedback: "Traveling to Stockholm, Sweden for secondments was a really amazing experience. There I worked in the lab of Prof Olof Ramström with Brian Timmer for an entire week. Not only was the entire research group extremely kind and welcoming but it was also very interesting to see how experiments are carried out in a different lab. It was very enriching to experience and compare the way problem solving is done in a chemistry laboratory as opposed to a biology laboratory. In the second week of this stay I also worked in the laboratories of Attana with Teodor Aastrup and Davide Proverbio where I had the pleasure of working with another amazing team and obtaining great preliminary results. Given the quality of the preliminary results obtained in the secondments during this first visit to these two laboratories we decided to further pursue this research project with a second visit to Stockholm to do continue with a bigger amount of samples and experiments which yielded even better results. Overall during these secondments I was extremely fortunate to have the opportunity to work with two great laboratories and not only did I learn some new experimental techniques but we also obtained very good results which we hope to be able to publish soon." Madalina Axinie – International Centre of Biodynamics (ICB), Roumania. Feedback: "It was a great opportunity for me to meet new peoples and to share knowledge with peoples from a different field then mine. I would like to kindly thank Dr. Barboiu for his help and support and also the team from Montpellier." 2nd Secondement : 3 weeks : September 8-26, 2014 – with Prof. Olof Ramström group in Roya Institute of Technology (KTH), Stockholm, Sweden. Project title: Synthesis of silica-functionalized nanoparticles; carbohydrate photoligation to multivalent scaffolds; characterization by Infrared (IR) spectroscopy. Feedback : Visiting another laboratory is always an enriching experience, helping you to acquire new scientific skills, exchange ideas with communicative people and work on building long-term collaborations with groups of excellence, inside the Network. This time, I had the chance to be hosted in Prof. Olof Ramström´s laboratory in the Chemistry department, Royal Institute of Technology (KTH) in Sweden. It was a definitely fruitful stay and I felt like going back to my organic chemistry-"roots", by exploring new aspects of receptor-inhibitors' synthesis and application. 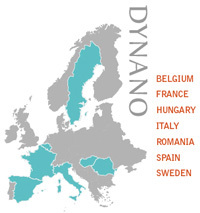 Undoubtedly, it was also an overwhelming chance to take advantage of the interdisciplinarity DYNANO has to offer and enlarge my knowledge in a field of research closely related to my actual project, while being surrounded by inspiring and helpful people. Thank you OR group! 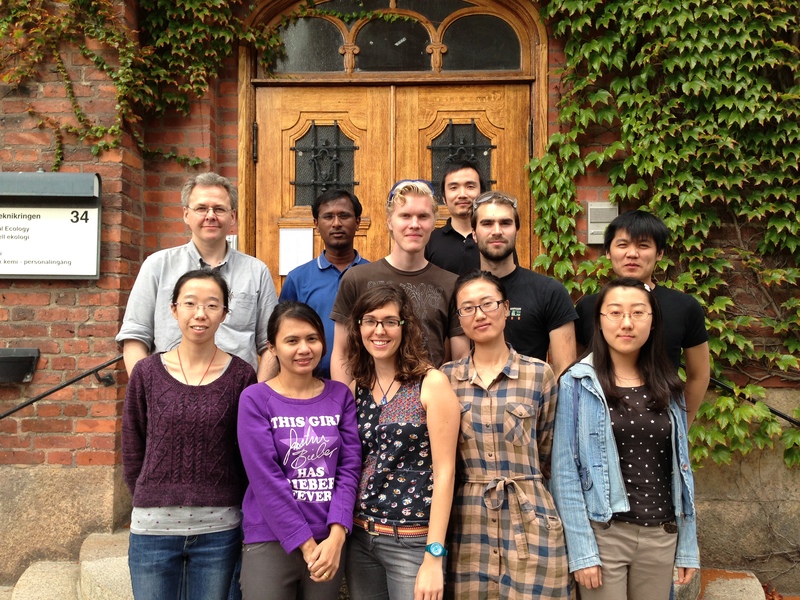 3nd Secondement : 2 weeks : September 28-OCtober 10, 2014 – with Dr. Teodor Aastrup's group in Attana AB, Stockholm, Sweden. Project title: Application of Quartz Crystal Microgravimetry (QCM) for determination of kinetic parameters in macromolecular interactions, with special focus on lectins; design of novel biosensor nanoplatforms; case study on extracellular vesicle-, bacteria (NT-Haemophilus influenzae)- and sugar nanoparticle-lectin interactions. Feedback: Following up my stay in KTH, I was seconded in Attana AB, a pioneer biosensor company and DYNANO industrial partner. 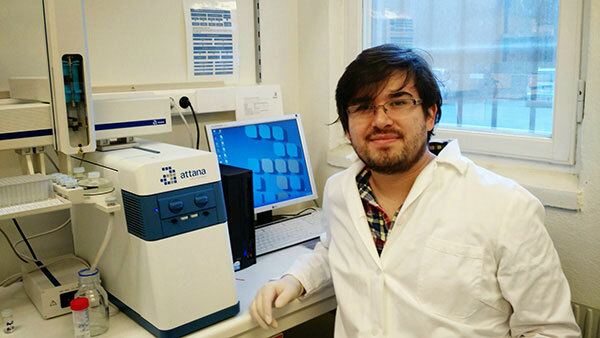 After being in contact for the first time with Attana's equipment and continuous-flow biosensor platforms during the QCM workshop in early September, my stay in their R&D department was an excellent opportunity to spread over what I had learnt and develop novel nanoplatforms with application in different fields. Attana's equipment permits a real-time and label-free determination of kinetic parameters in molecular interactions, as well as the evaluation of target accessibility on the cellular surface, a factor of significant impact in the search of novel biomarkers. The data achieved strongly supported our developed microarray nanoplatforms' results (IQFR-CSIC, partner 5a), providing interesting, novel insights into the lectin-carbohydrate interactions' dynamics and kinetics. My experience in Attana was fruitful and constructive, since it gave me the chance to apply the QCM technique in my fields of interest, at the same time as becoming familiar with basic entrepreneurship concepts and R&D processes in the industrial sector. I feel grateful to Dr. Teodor Aastrup for inviting me to Attana AB and in this way opening up a new window to the enterprise-world to me and giving me the chance to work even for a short-time with high-skilled and enthusiastic people in a friendly environment; moreover, I would like to specially thank Dr. Davide Proverbio, for his excellent teaching skills and assistance, for sharing his biosensor experience and ideas and exchanging proposals for further QCM applications. 1st Secondement : 3 months : May - July 2014 – with Dr. Mihai Barboiu's group at the European Institute of Membranes, Montpellier, France. Feedback : "First of all, visiting another institution in the framework of our Marie Curie ITN is a great opportunity to acquire new scientific skills, learn new methodology and above all, broaden your horizons by getting to know other approaches and points of view. Exchanging opinions with communicative scientists in coherent fields, obtaining multidisciplinary, cutting edge knowledge and building long term collaborations is another important attainment. It is true that lifestyle and working environment changes are not always easy and visiting a country for a short term stay with the goal to learn as much as possible may result stressful. However, when you start working in a different group and you get integrated, while being surrounded by open and collaborative people, you understand that language is not a barrier. The adaptation process becomes smooth and the learning activities challenging and inspiring, while you enrich your research experience with new disciplines. This helps you to gain a complete view of the subject, optimize the experimental process and become even more productive. My secondment in Prof. Edit Buzás' group in SE, gave me many new ideas, a great impulse in my plans performance along with high motivation to continue working on our collaboration back to my base, IQFR-CSIC in Madrid. In this point, I would like to specially thank Prof. E. Buzás for her support, her help and interest, as well as my laboratory partner and PhD student in SE, Xabier Osteikoetxea, for sharing his experience and ideas, for exchanging proposals and future plans. Overall, I definitely admit that my secondment was a constructive experience and I would like to encourage my colleagues to benefit from it in the first steps of their fellowships, as it can give them a boost in all levels : gain in knowledge, hands on training and inspiration, work on science exchange and advancement, while enhancing their communication and teamwork skills. Indeed, the secondments are one of the major Marie Curie Initial Training Networks' aspirations as well as superb advantages for the recruited early stage researchers." 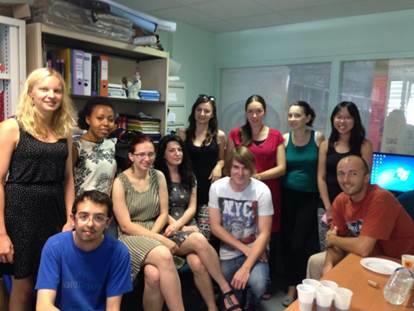 1st Secondement : 3 months : May -July 2013 – with Dr. Mihai Barboiu's group at the European Institute of Membranes, Montpellier, France. Feedback :"My secondement in Montpellier gave me a chance to meet new people, to enlarge my knowledge and it helped me to develop new ways of thinking about my field. Because of these reasons I can say that I had a great experience at IEM Montpellier". Erol Licsandru - CNRS- European Institute of Membranes, Montpellier, France. Feedback: "It was great. I got to learn new methods from other fields of research and to meet new and interesting people.... I would also like to take this chance to thank the people from ICB for all their help and support"
Feedback : "This secondment was really useful to me and my project. I iniciated a collaboration with Brian and Olof Rämstrom and it seems that it is going to be a long-lasting and fruitful one. It was very rewarding to learn how they work in another organic synthesis laboratory. I improved my skills in a different kind of synthetic chemistry and I adquired novel knowledge on a great variety of either practical subjects and theoretical ones. To sum up, during these three months in the KTH laboratory I had the time to learn about their chemistry, the Dynamic Constitutional Chemistry, to get new ideas about my project that I want to test afterwards and even to participate in the writing of a chapter for a Chemistry Encyclopedia! Moreover, I grew up not only as a chemist but also in terms of adquiring other competences that will be useful in my life, since having the possibility of living in different countries and getting to know new people and their culture is always worthwhile and gratifying! I cannot express with words how satisfied and happy I am after this experience, I came back to Namur with renovated energies after the summer to start the new academic year with even more enthusiasm :)"